NO-NONSENSE BRAN TUB of films from around the world selected to “stimulate the creative imagination of children” initially produced by BRIAN COSGROVE and presented by DOROTHY SMITH (first outing: “A Calm Country River in Holland”). 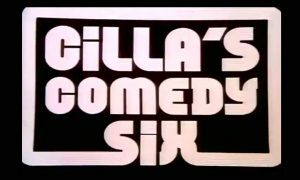 In 1969, the friendly-but-dull ALAN ROTHWELL (catchphrase: “Hello!”) took over, kicking off with hardy perennial THE RED BALLOON, and remained in the driving seat for the duration. Shortly after that, the trademark opening blurred footage of a rotating jewelled casket was installed, accompanied by those timeless off-kilter strains of ‘Manege’ by Structures Sonores’ Lasry-Baschet. The Little Match Girl, The Forth Road Bridge, Amelia and the Angel and Czech animator Karel Zeman’s Mr Prokouk films (a sort of sub-Prof off of VISION ON pork pie hatted inventor) were regular visitors to the hypnotic world of Rothers. Alan took a breather in the spring of ’72 as BARRY SMITH and his theatre of puppets – then also doing sterling work with Al’s other kids’ show, HICKORY HOUSE – took over. In ’74 came activity pack back-up and programme advisers, as the education got serious. Marcel Marceau cropped up a lot, as did cartoon opera The Bricklayers Built a Crooked Chimney, Niko: Boy of Greece, that Canadian cartoon wherein one Dr. Philip Square tunnelling into the Earth’s core and propelling himself back again via the evaporated piss of his pet dog, and “a close, unusual look at the cow”. Survived into the late ’80s, though the move to Channel Four with the rest of the ITV schools’ output brought a new, brasher title sequence and a significant reduction in that queasy wonder quotient. Does anyone have the full length theme tune for this? It was called ‘Manege’ by Lasry/Baschet from their Structures Sonore No4 lp. There’s a short version of it on a DJ mix album I’ve got, ‘The Trip’, by Tom Middleton. It’s hidden as a bonus track after Don’t Leave Me This Way by Harold Melvin & The Blue Notes. The Bod theme tune and the Newsround end theme are on it as well. The clip from this which had our class rolling around helpless with laughter wasn’t from a cartoon, it was a film about skipping. In particular the shot from below of a hairy bloke jumping on a sheet of clear glass or plastic, with the exaggerated size of his bare feet provoking howls of mirth. Made a change from the girls getting scared and feeling sick because of the theme tune. Every time. The 2 short films I remember seeing on Picture Box featured a silent film showing someone carving a small wooden native american sat in a canoe, They take it to the beach where it floats out to sea. You then see it’s epic voyage as floats across the ocean past various big ships. It ends up washed up on a beach looking rather battered. A small boy finds it and takes it to his dad , who ends up giving it a new lick of paint and setting it off for another epic journey. The other film was another silent one opening with a boy and his dog rowing up a lake. The film suddenly stops and the camera zooms in without stopping until you can see a microscopic close-up of a mosquito on the boys arm, Then the camera zooms out again right out into into the universe. It keeps zooming out until the stars and the cosmos become the close-up of the mosquito on the boy’s arm again,pulling out until we’re back to the original shot of the boy and his dog. The film resumes, and they row out of shot. Damn peculiar stuff. I remember seeing the canoe one. I don’t remember any of the short films, only the really creepy music and revolving glass coffin-box. Oh yeah, and that possessed fella sitting in the dark. Carefree childhood days. Picture Box was the most memorable ITV schools programme particularly at the time Alan Rothwell presented. 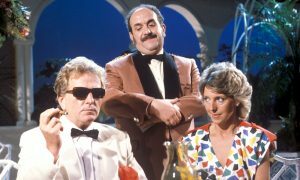 He became available for presenting duties when his character in ‘Coronation Street’ David Barlow was written out. 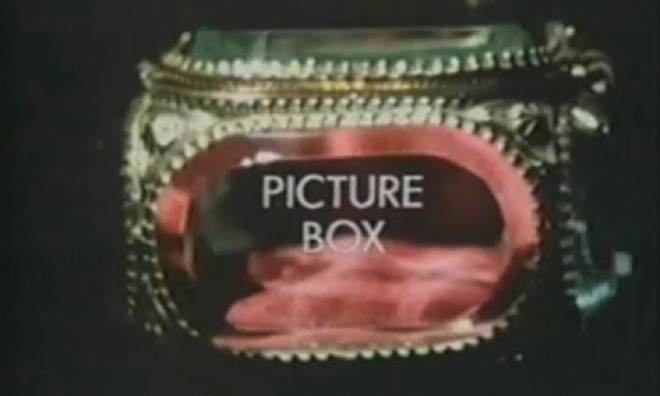 Alan remained presenter of ‘Picture Box’ until the 1990s. Help!! A 2 part film shown on picture box about an old guy dragging a canoe up a mountain, for some reason, there was something about him pulling his teeth out with pliars?? Yes, this was on Picture Box with Alan Rothwell. Anyone know what the short film was called.